Glam Restaurant and Cocktail Boite on trendy Albermarle Street. Gazelle is the latest creation of Tony Conigliaro, one of London's most famous bar and lounge entrepreneurs. 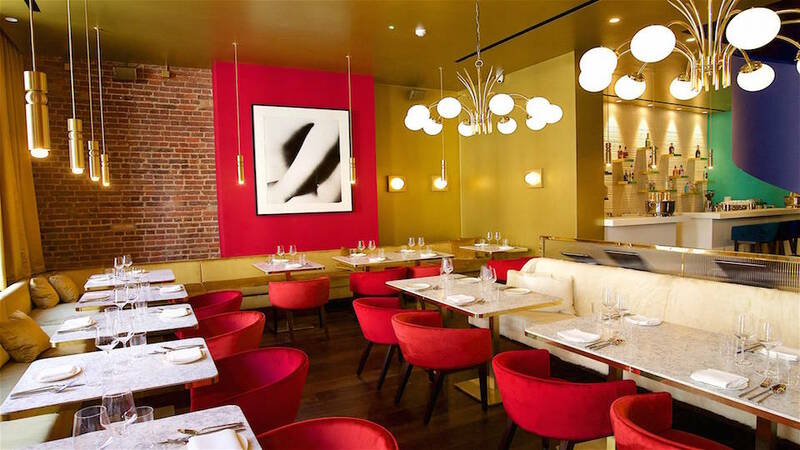 Situated on Albermarle Street in London's swanky Mayfair neighborhood, Conigliaro and chef-partner Rob Roy Cameron have spared no expense debuting a space that blends fine dining with equally outstanding entertainment. The space is huge, with 2,500 sq ft of elegant interior divided between two floors, accessible from a private elevator outside and a dramatic spiral staircase inside. The mid-century décor recalls a sexier, more swinging time, with red velvet chairs, marble table tops, and gold fittings. Gazelle does not serve individual dishes and instead offers a varied and satisfying selection of sharing plates and small dishes. The names on the menu don't often provide much insight into what to expect, but dishes are organized from light and delicate to more intense and heavy. Tender squid with girolle mushrooms epitomize the former, seared beef with juniper and salted plum the latter. All dishes are prepared to a very high standard. The bar scene is energetic and pampered, with a team of mixologists at hand to prepare a variety of familiar classics and innovative new creations. Champagne cocktails and house originals like the Babydoll (rum and rhubarb with lemon) are worth the wait.